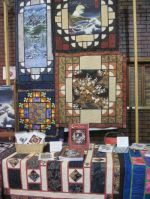 The quilts below are in private collections and are not for sale. They are representative of some of my earlier work. I will be adding new work soon. Please click on the thumbnail to see a larger image and/or details.